Coquecigrues designs and manufactures luminaires, decorative objects, patinated furniture and textiles in ancient style inspired by the french XVIIIth century cultural legacy. The word "Coquecigrues" is born under Rabelais' feather around 1534, a writer's fantasia to raise each and everyone's dreams. 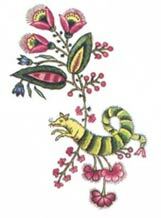 In 1792, those "Coquecigrues", mythical characters half insect half bird, reappeared in a pattern of the famous Jouy-print style.